I could be wrong, but I’d venture to guess there is more nonsense andmisinformation about the flu vaccine than any other vaccine out there. Perhaps it’s because it’s a once-a-year vaccine, so that cyclical nature brings out new myths each year. Or maybe it’s because it’s for an illness that many people have had, even more than once, and survived, so they mistakenly assume a vaccine is unnecessary. Whatever the reasons, I’ve decided a comprehensive post addressing every myth I’ve been able to find is long overdue. I plan to update this post as necessary, and I’ll likely republish it each year as a reference. To make it easier to navigate, I’ve listed all 25 myths here at the top with links to that myth’s debunking explanation. This is by far the most common myth I hear – even though it’s scientifically impossible from the inactivated vaccine. Are there people who become sick right after having gotten the flu shot? Of course, and it’s an illness they had likely caught before the shot and it took a a few days for symptoms to appear, or it’s just coincidence (and it may or may not be the flu). The flu shot takes two weeks to confer protection, and it takes 2-5 days to incubate a flu virus. A person who does come down with the flu within a week of getting the shot was already infected when they got the vaccine. Even with the live vaccine in the nasal spray, the weakened virus cannot cause the flu. However, it is theoretically possible to “shed” the virus after receiving the live vaccine, thereby infecting others, though no serious cases have been reported of this occurring. Edit: One thing worth noting is that some people may feel “under the weather” or generally crappy for a few days after the shot or a week or two later. A headache, nausea, fever, etc. can be a result of the side effects of the vaccine, usually from the immune system ramping up and producing antibodies against those influenza strains. Some may consider this feeling “sick,” but you are not sick in the sense that the flu vaccine caused you to fall ill from a pathogen, and the vaccine certainly didn’t give you the flu. Single dose-shots of the flu vaccine and the flu vaccine nasal sprays do not contain any mercury compounds. The multi-dose flu shot does contain a preservative called thimerosal, which breaks down into 49% ethylmercury and used to prevent bacterial contamination of the vaccine container. Ethylmercury, as I’ve discussed before, is processed differently by the body than methylmercury, the neurotoxin that can build up in the body and is found in fish. (Keep in mind the difference a letter can make in chemistry: methanol is anti-freeze while ethanol is a Chardonnay.) Ethylmercury is made of larger molecules that cannot enter the brain andexits the body within a week. There is no danger in receiving a vaccine with thimerosal – they’re given all over the world and it’s been extensively studied, even for cumulative effects on children over several years. And, keep in mind, if you’re just one of those paranoid types, you can easily request and get a flu shot without the preservative. The claim of antifreeze being in vaccines comes from the use of octylphenol ethoxylate (Triton X-100) (in Fluzone) or octoxynol-10 (Triton X-100) (in Fluarix) used to inactivate those viruses or to purify other vaccines. Polyethylene glycol by itself is one component of antifreeze but is not antifreeze itself, just as water is a component of antifreeze. But these are not the same as polyethylene glycol and involve the use of Triton X-100 as a splitting agent, which has been shown to be safe. Learn more about specific components of flu vaccines here, but remember, again that ONE LETTER can make a huge difference in what you’re talking about. I’m pregnant, and I got the flu shot last week, as should all pregnant women without medical contraindications, as the CDC recommends. The flu shot is safe for pregnantmothers, and even after their child is born, mothers who got the flu shot while pregnant have provided their babies with a bit of extra protection against acute respiratory infections. They also may reduce children’s risk of other conditions, such as bipolar disorder, associated with prenatal influenza exposure. And, moms who get the flu shot also offer their babies some protection against the flu from birth, even if they plan to breastfeed. Not only does the flu shot not cause miscarriage, this non-pharma-funded study in the New England Journal of Medicine actually shows that the flu shot *decreases* the risk of a miscarriages/stillbirths in pregnant women, not least because having influenza itself during pregnancy is linked to miscarriages. Interestingly, the flu shot can even reduce women’s risk of other birth complications, such as a preterm birth or an underweight baby. This myth is even addressed on the Alzheimer’s Association website, where they note the2001 study showing a *reduced* risk of Alzheimer’s among those who had received flu vaccines, the polio vaccine and the tetanus and diphtheria vaccines. In fact, the risk for developing Alzheimer’s was half as much for those receiving these vaccines. The myth originated with a quack named Hugh Fudenberg who has no evidence for the claim. There is no question that pharmaceutical companies are for-profit companies and that they really rake in the billions. If they didn’t make a profit off vaccine, they wouldn’t manufacture them. However, the profits they earn from vaccines are a drop in the bucket when considered along with chronic condition medications such as blood pressure meds and mental health drugs, not to mention the cash flow from medications like Viagra. But the recommendations for vaccines come from public health organizations such as the Centers for Disease Control and similar public health, government and academic institutions across the world. Unless you think all those countries’ governments and public health officials are involved in a huge conspiracy or money-making scheme with Big Pharma (and if you think that, read this), then the fact that vaccines offer a profit to pharma companies isn’t a reason not to get vaccinated. In fact, influenza itself is quite costly, costing the US about $4.6 billion annually in direct medical costs and as much as $87 billion annually in all costs. There are a couple things to keep in mind about the effectiveness of the flu vaccine that vaccine researcher Jessica Atwell mentioned to me. First, the flu vaccine has historically protected against only three strains each year (the live vaccine FluMist this year protects against four for the first time this year), but there are many more strains circulating each year. The World Health Organization make educated guesses by February about which strains will be circulating later that fall: some years their algorithms for picking the strains are better than others. Yet in even the years when their estimates fall short, the flu shot is worthwhile: a meta-analysis looking at 34 randomized, controlled trials across 47 flu seasons found that even when the strains in the flu vaccine do not match the strains circulating that year, the flu vaccine offers a measure of protection against the circulating strains. Next, the effectiveness of the flu vaccine varies for different age groups, partly because of the way the immune system ages. “Generally speaking, your immune system peaks in early adulthood and goes downhill from there – hence less than ideal efficacy of standard flu vaccines in the elderly,” Atwell said. Yet even studies showing low overall effectiveness — this one found anywhere from 33 to 100 adults need to be vaccinated each year to prevent one case of the flu — still show a reduced risk of the flu in vaccinated individuals. Coming at it from a different angle, another recent study estimated that vaccination preventedanywhere from 1.1 million to 5 million flu infections during each flu season over six years. Again, some years, the flu vaccine’s effectiveness is very low. Other years, it’s better. But just because it does not work 100% all the time for all people does not mean it’s worthless or ineffective. Some days, I feel like I’m only operating at 50% human capacity — but I still need to be a mother to my son, and I’m better than no parent at all for him. Or, for a simpler analogy: If there is a 50% chance it’s going to rain, do you take along the umbrella even if it’s an inconvenience? Some do because they don’t want to get wet if it does rain. Some bring it, but it’s a bad storm and they get a little wet anyway. Others don’t bring the umbrella. The difference? By not getting yourself vaccinated, you potentially put others at risk for catching the flu from you, if you catch it. The Holy Grail, of course, is a universal flu vaccine to provide protection against many or all influenza strains. It’s a goal that many flu vaccine researchers have been working toward for years, but there are many challenges to such a vaccine and success has been elusive. As noted above, the effectiveness of the flu vaccine varies by age and by which vaccine (live or inactivated) a person gets, but there is no doubt that it offers some protection against the flu. As Melinda Wenner Moyer points out in this Slate piece, the live vaccine (FluMist) is more effective for kids aged 2 to 7, up to 83% effective (meaning kids who get the vaccine are 83% less likely to get the flu than gets who aren’t vaccinated). To put that study’s finding in absolute number terms, 16% of unvaxed kids got the flu compared to 3.4% of those who received the live vaccine. Meanwhile, the (inactivated) shot only offered 48% effectiveness in another study. (Moyer’s article is worth reading in full for more details about flu vaccine effectiveness in children and teens.) Another review of the research found that, for children under 6 years old, one child would be prevented from contracting influenza for every six who were vaccinated with the live vaccine. For children over 6, one case of flu could be prevented for every 28 kids who received the inactivated vaccine. Moyer also notes that the research on the effectiveness of the flu for kids aged 6 months to 2 years is weak, mostly because there isn’t much data available. (That’s based on a Cochrane review whose only data set on children under 2 was a study with 16 infants.) It’s true the data is thin, but it’s not entirely nonexistent. The CDC notes that one study found the flu vaccine to be 66% effective in preventing lab-confirmed influenza in children aged 6 months to 2 years old. (While this study did not find the flu vaccine to help prevent ear infections,others have found that.) Another study has found a good immune response to the vaccine among children (including infants). In another, focused specifically on children aged 9 months to 3 years, only 4% of vaccinated children under age 2 caught the flu compared to 12% of the unvaccinated children, for another finding of 66% effectiveness. This myth is just bizarre. For one thing, catching the flu will weaken your immune system while you’re sick, during which it’s easier to become ill from other bugs. But more importantly, pneumonia is among the most common complications to occur as a result of a flu infection, so getting the flu shot *reduces* your risk of pneumonia, a leading cause of death among those who die from influenza complications. This is another myth that should be flipped on its head. There is no evidence that the flu vaccine causes vascular disorders. Meanwhile, the vaccine has been shown in multiple studies to reduce individuals’ risk of heart attacks, stroke and other cardiovascular events. There is no evidence that flu vaccines can hurt children’s development or that children’s neurovascular structure are affected by flu vaccines. A child’s blood brain barrier is formed in utero and is functional from birth in regulating what can and cannot pass into the brain. Researchers at Stanford University and the University of California – San Francisco discovered in 2010 that pericytes are required for blood-brain barrier development and that pericytes are present in the fetal brain. This research shows that an infant’s blood brain barrier is developed before birth. The physiology of the blood brain barrier and how it functions at that level of development make it highly implausible that any vaccine components could penetrate the barrier. This is one of the few myths that is rooted in a small amount of fact, though it’s often misrepresented or blown out of proportion. Narcolepsy is a neurological disorder in which the brain in unable to regulate sleep-wake cycles. Several studies, first in Finland and then in other European countries, found and confirmed a link between narcolepsy and the 2009 H1N1 flu vaccine called Pandemrix, manufactured by GlaxoSmithKline Europe and used in several European countries (but not in the US or Canada). It was not used before 2009 or since the 2009-2010 season, and no links to narcolepsy have been found for US-manufactured H1N1 or seasonal flu vaccines. The CDC is sponsoring an international study on the link between the 2009 H1N1 flu vaccines and narcolepsy, expected to be completed in 2014. One hypothesis for the link relates to an adjuvant called ASO3, an oil-in-water emulsion. Adjuvants are substances added to a vaccine to increase the body’s immune response to that vaccine; US influenza vaccines do not contain adjuvants. Other possibilities for the narcolepsy risk include immune stimulation from the vaccine itself, immune activation from H1N1 infection or another infection present at the time, or a combination of these factors. It’s also possible the narcolepsy risk is related to the H1N1 virus itself, which could means the flu infection could increase the risk of narcolepsy — but these are all conjectures at the moment. Recommendations in Europe were initially revised for the vaccine and then Pandemrix was suspended after the evidence came to light. The increased risk was estimated at an additional 3 to 7 cases of narcolepsy for every 100,000 vaccinated children (the link was only seen in those under 21). Guillain Barre syndrome (GBS) is an autoimmune disorder in which the immune system mistakenly attacks a person’s own nerve tissue, causing muscle weakness and sometimes temporary paralysis. The disorder affects approximately one person out of every 100,000 individuals. Causes are not well understood, though the disorder has been linked to viruses including cytomegalovirus, Epstein Barr and influenza (as well as the bacteria campylobacter). Two other studies specifically on the 2009 H1N1 vaccine did find an increased risk of GBS — but not as high as the risk of GBS from the flu itself (or the risk of death from the flu). Thefirst one found a risk of 1 additional case of GBS per every 1 million vaccinations and 17 additional cases of GBS for every 1 million influenza infections. The other found a slightly higher risk – 1.6 cases of GBS per 1 million vaccinations – for the H1N1 influenza that killed about 280,000 worldwide (more than 12,000 of whom were in the US, which recorded 61 million H1N1 infections during 2009). There is no evidence that the flu vaccine can cause neurological disorders, but there is evidence that influenza can. 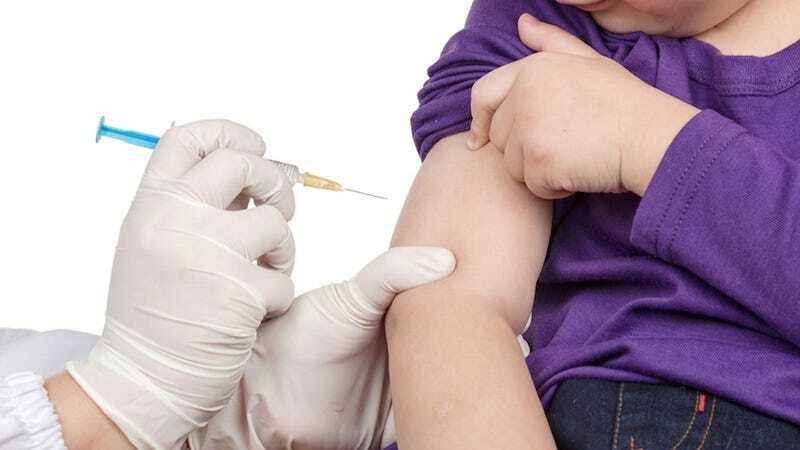 Meanwhile, children with neurological disorders or other neurodevelopmental conditions are especially encouraged to get the vaccine because they are at a higher risk of complications from influenza than other children. Almost half of the children who died from the flu during the 2009 season had underlying neurological disorders, such as epilepsy or cognitive dysfunction. Influenza is a serious illness. The symptoms are similar to other illnesses, so people often mistake milder illnesses for the flu. Some lucky folks do recover in a few days, but most are down for a week or two, and complications can be life-threatening, especially complications in children. Not everyone gets a fever, but having the flu isn’t pleasant, especially given the minor side effects or low risks for serious side effects from the vaccine. People die from the flu. Every year. This includes children with no underlying conditions (plenty of unfortunate stories here). In fact, a study published just today in Pediatricsreported that 43% of the more than 800 children who died from the flu between 2004 and 2012 had no underlying medical conditions. Often, influenza might contribute to a death but not be listed on the death certificate if the individual died from complications of the flu, such as pneumonia. Before debunking this myth, it’s important that people know the flu vaccine Flublok, available for the first time this year, is manufactured without eggs. Recommended by the CDC earlier this year, Flublok is recommended only for those aged 18 to 49. For those not in that age range, or if the new vaccine is unavailable, the American College of Allergy, Asthma & Immunology states clearly, “People with egg allergy are not at any additional risk of having a reaction when given the flu vaccine even though the vaccine may contain some amount of egg protein.” This statement is based on the evidence in theirinfluenza vaccination recommendations (paywall), summarized here. Influenza is a virus. Antibiotics fight bacteria (anti = “against”; biotics = “of life,” referring to living bacteria, not to viruses). All the antibiotics in the world won’t help you fight off a flu infection. As noted further up, getting the flu vaccine does not guarantee you won’t catch the flu. It does reduce your risk of getting the flu, and it can lead you to have a milder course of the illness than if you hadn’t been vaccinated. It’s also entirely possible that you catch a strain of the flu not covered in the vaccine. Millions of people have never gotten into car accidents. They still wear seat belts and carry insurance. Influenza is an airborne virus, so although hand-washing is important and can reduce your risk of becoming ill from other germs, it does not affect your risk of catching the flu. Eating a healthy, balanced diet is also important, and certainly being healthy makes it easier for your immune system to fight off new infections. But simply eating well cannot magically prevent you from being exposed to the flu virus. As noted above, your immune system is weakened while you’re ill from the flu. While your immune system may be strengthened after you recover against that particular strain, a vaccine primes your immune system to fight off influenza strains in the same way (without the week of fever, chills and vomiting). Additionally, if you catch the flu, you are contagious to others. Being vaccinated helps keep herd immunity levels higher in your community, especially protecting those who are weaker or cannot be vaccinated. This myth is a challenging one to address succinctly without oversimplifying the science. The short answer is that current vaccines are not going to create more dangerous variants of a flu strain. Influenza virus strains are evolving and changing on a regular basis in two main ways: “antigenic drift and antigenic shift.” Drifts are small, gradual changes that happen all the time in response to environmental pressure and even within our own bodies. The influenza virus has a segmented genome: its genome is in eight parts which can randomly re-assort. When the virus infects an individual, it can “exchange” these gene segments and change within that one individual. Our own immune response can invoke a selective pressure on the virus that contributes to drifting, with or without a vaccine. If the virus didn’t change at all from year to year, the flu vaccine would never need to be reformulated each year (and that Holy Grail of a universal flu vaccine would be less elusive). Interestingly, some believe it’s possible that high levels of herd immunity could reduce antigenic drift. This researcher explains, “As herd immunity increases, we should expect to see more antigenic drift; however, if immunity is high enough to prevent the population-wide spread of the pathogen, the epidemic cannot take off and the virus does not evolve.” Regardless, current vaccines are not going to create more dangerous variants of a flu strain. The most common side effects of the flu vaccine are aches, itching, fatigue, headache, fever, hoarseness, sore or red and itchy eyes, a cough and soreness, redness or swelling where the shot was given and aches. Young children may, in rare cases, develop a high fever (a febrile seizure) that can result in a short seizure, not causing long-term damage. The most serious risk is an allergic reaction, possible in approximately 1 out of every 1 million doses. In the H1N1 vaccines already noted above, Guillan Barre syndrome may be an increased risk for 1 to 2 of every 1 million doses, though it’s many times more common from influenza itself. The flu itself, as noted above, is much more serious and can cause death. As I was writing this post, a friend notified me that their spouse had developed Bell’s palsyfollowing the flu shot. I have not heard this mentioned as a myth, so I investigated it. It appears that one flu vaccine used in Switzerland during the 2000-2001 season might have been linked to an increased risk of Bell’s palsy (46 cases). An investigation of US reports in the decade prior also appeared to show a risk, which led to a more in-depth study. That in-depth one found no increased risk, which a report from the independent Institute of Medicinefound as well. In addition, a study looking specifically for Bell’s palsy risks in children after a flu vaccination found no increased risk. Sometimes it can be tough to separate cause from correlation and to determine whether two things that happen at the same time are related or coincidence — hence the reason for multiple studies. However, it is important that adverse events occurring after any vaccine is given are reported to the Vaccine Adverse Event Reporting System (VAERS) so that researchers can follow up on conditions that are reported multiple times. It’s best that a doctor make the report since medically confirmed events are generally given better weight. Most likely, based on the research known to date, the friend’s spouse developed Bell’s palsy for another reason that occurred unfortunately at the same time as the flu shot (the condition can be caused by a wide range of viral infections, including the flu itself). Since the report occurred this year, there is insufficient evidence to determine for certain if it is related to the flu shot or not; it’s only possible to hypothesize that it wasn’t based on past evidence. But the friend should report it to VAERS nonetheless. This is how new associations, such as the narcolepsy link with the European 2009 H1N1 Pandemrix vaccine, are identified. For another great debunking of flu myths about the H1N1 vaccine, which also apply to some of the myths of the seasonal flu vaccine, check out Emily Willingham’s post here. If you’ve read the alarmist “Should I Get the Flu Shot?” post from “Food Babe,” here’s a great, in-depth debunking of that piece. Special thanks to the extensive research for this post goes to Kathy McGrath, Nathan Boonstra, Jessica Atwell, Rene Najera, Amber Bickford Cox and Emily Willingham. This post was originally published on Red Wine & Apple Sauce, a health/science news blog with a focus on topics pertinent to parenting and written by Tara Haelle. You can follow her blog on Facebook, follow Tara on Twitter here, or find out more about her over at her personal website. This post has been republished with permission from Red Wine & Apple Sauce.